Adverse effects of opioids can occur because the drugs act at both injured and healthy tissue, but if researchers could find a way to direct opioids only to the former and not the latter, perhaps the drugs would lack off-target activity. Now, a new report reveals the design of a novel opioid that only works where inflammation exists, leaving healthy tissue untouched and avoiding the unwanted consequences seen with traditional drugs. Using computer modeling, a team led by Christoph Stein, Charité - Freie Universität Berlin, and Marcus Weber, Zuse Institute Berlin, Germany, modified the chemical structure of fentanyl to create a new opioid, named NFEPP, that only binds to mu-opioid receptors (MORs) under acidic conditions, a hallmark of inflammation; this allowed them to target NFEPP only to sites of inflammation caused by tissue injury. In two rat models of inflammatory pain, NFEPP was analgesic but did not lead to typical side effects such as sedation, addiction, and respiratory depression. The study was published online March 2 in Science. The side effects of opioids, including nausea, constipation, addiction, sedation, and respiratory depression, are thought to occur because MORs are widely expressed throughout the body and brain. As a result, researchers have sought ways to make opioids more specific to pain pathways while leaving non-pain pathways alone, through “biased agonist” approaches targeting mu-opioid receptors and kappa-opioid receptors, for instance (see PRF related news stories here and here). This led Stein to consider the unique properties of injured tissue that could be exploited to target opioids to the desired areas. One such property is inflammation, which causes a drop in pH from physiological levels of 7.4 to acidic levels of about 5.4 (Holzer, 2009). Co-first authors Viola Spahn and Giovanna Del Vecchio, along with Stein and colleagues, hypothesized that an opioid that binds MORs only during acidic conditions should activate the receptors only at sites of injury, where pain signals originate. “There are several indications that MORs can be pH sensitive,” according to Stein. “So Marcus Weber’s team created an artificial inflamed environment in a computer simulation to explore how changes in pH could affect MOR signaling and agonist binding,” he said. In the simulation, the investigators examined how a traditional opioid, fentanyl, interacted with MORs at different pH levels. They found that, at both normal and acidic pH, fentanyl was fully protonated, which is necessary for it to bind MORs. Stein and Weber reasoned that if they could create a compound with a lower acid dissociation constant (pKa), a measure of an acid’s strength, than that of fentanyl by replacing hydrogen atoms with fluorine, the compound would only bind to MORs under acidic conditions, since it would be less likely to be protonated at higher pH. After multiple iterations, they settled on a design that replaced hydrogen atoms near the tertiary amine group of the fentanyl molecule that interacts with the MOR. “In the past, the pKa of NSAIDs has been modified to increase accumulation of the drugs in inflamed tissues, but in our case the lowering of the pKa was done to change how the opioid drug directly interacts with MORs,” says Stein. The next step was to actually synthesize the compound. They named it NFEPP. With the newly synthesized NFEPP compound in hand, the group needed to test the predictions made in the computer simulations. To do this, they expressed MORs in human embryonic kidney 293 (HEK293) cells and performed binding affinity assays. In these assays, they exposed the cells to a radiolabeled ligand of MORs (DAMGO), followed by increasing concentrations of either fentanyl or NFEPP. As the concentration of fentanyl or NFEPP increased, each drug would slowly displace DAMGO; the stronger the binding affinity of these compounds, the more DAMGO would be displaced. As anticipated, fentanyl had similar binding affinities at both physiological and acidic pH. NFEPP, on the other hand, only had a binding affinity similar to that of fentanyl at acidic pH. To demonstrate that NFEPP didn’t just bind MORs at acidic pH but also activated them, the team used an imaging technique called real-time fluorescence resonance energy transfer (FRET) to measure the dissociation of the three G protein subunits inside the cell that are bound to the MOR, an indication of functional MOR activation. As expected, NFEPP induced no G protein dissociation in MOR-expressing HEK293 cells at physiological pH. At acidic pH, however, NFEPP induced robust G protein dissociation, indicating that it both bound to and activated MORs. The researchers further found that a hallmark downstream signal of MOR activation, the inhibition of cyclic AMP (cAMP), also occurred with NFEPP incubation, again only at acidic pH. Knowing that NFEPP activated MORs only at acidic pH, the researchers then tested the drug in two rat models of inflammatory pain: hindpaw injection of complete Freund’s adjuvant (CFA), which induces prolonged pain, and plantar incision, which causes short-term pain. These injuries were made to a single hind paw, leaving one paw uninjured to act as a control. Using a pH-sensitive glass microelectrode, the team confirmed that both models showed a drop in paw pH that was sufficient to allow NFEPP binding to MORs. Four days following CFA injection or two hours after the incision, injured rats showed hyperalgesia (measured with the paw pressure test), allodynia (measured with the von Frey test), and thermal hypersensitivity (measured with the Hargreaves test). Intravenous fentanyl reduced this pain but also decreased sensitivity in the uninjured paw, demonstrating the non-specificity of fentanyl. NFEPP, however, relieved pain only in the injured paw. Not only did NFEPP avoid off-target activity, but it also produced analgesia comparable to the pain relief observed with fentanyl. The group further demonstrated that NFEPP acted peripherally, and not centrally, by treating the rats with an opioid antagonist that doesn’t cross the blood-brain barrier. Whereas the antagonist decreased only some of the fentanyl-induced analgesia, indicating that fentanyl acts both peripherally and centrally, it blocked all of NFEPP’s analgesia, signifying that the new compound acts only in the periphery. Further, by only targeting MORs at the site of injury, NFEPP did not cause adverse side effects from off-target actions of opioids, including the addiction potential, respiratory depression, sedation, and constipation that were seen with fentanyl. “The biggest advantage with this is that we may be able to avoid side effects seen with opioids and even NSAIDs, which can cause other serious problems like gastric ulcers, cardiovascular issues, and stroke,” said Stein. Although very promising, NFEPP is years away from clinical use. “The next step would be Good Manufacturing Practice [GMP] production of this compound to bring it to human trials, but that is a very expensive process,” says Stein. It’s also unclear how broad the applications of NFEPP in the clinic might be. Interestingly, the current study raises the possibility that the new approach could be used to improve other recently developed opioids. “If you could combine this process with other methods of biasing downstream opioid signaling pathways, you could really produce a very robust, safer opioid analgesic,” said Bruchas. 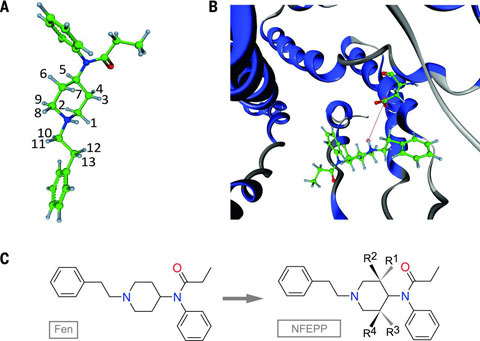 A nontoxic pain killer designed by modeling of pathological receptor conformations. Science. 2017 Mar 03; 355(6328):966-969.